Hyderabad,: The Computer Society of India (CSI) and RCI (DRDO) in collaboration with NetApp today organized the ‘’Trends and Innovations for Next Generation ICT (TINICT) – International Summit, 2017.’’The International Summit provided a forum to exchange ideas among researchers, scientist, developers and practitioners in the areas of computing, communications and informatics. Shri JayeshRanjan, Principal Secretary – Information Technology (IT) – Government of Telangana and Dr. B.V.R. 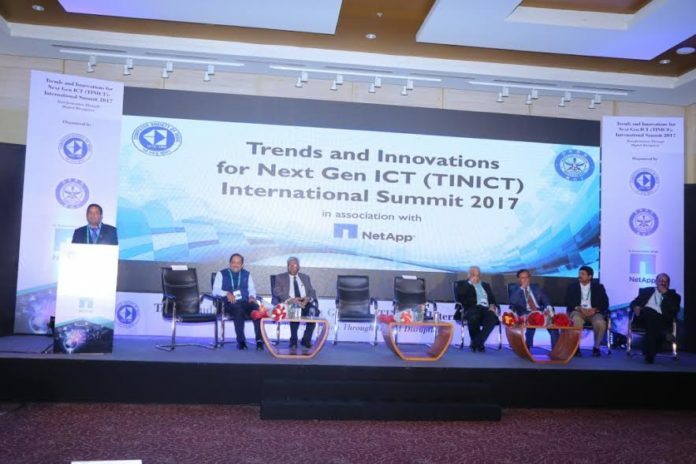 Mohan Reddy, Founder& Executive Chairman Cyient were the Chief Guests for the event that saw impressive participation with over 150 delegates including IT heads of government organizations, private sector industries, public sector undertakings, legal authorities, defense research organizations and university faculty. The Summit discussed key themes behind India’s digital revolution including the IoT scenario in the digital age, leveraging 3rd Platform & Big Data Technologies, cybersecurity in a digitally connected world and the evolution of secure private & public cloud; how organizations can work together to drive efficiency. The International Summit has been organized to celebrate the foundation day of Computer Society of India (CSI) which was founded on 6th March, 1965 at DRDO campus Hyderabad.